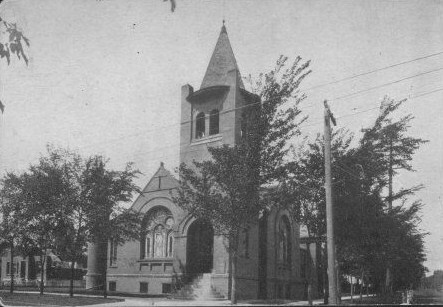 First, this picture of the First Methodist Church indicates that it was built in a dense growth of older trees. This would indicate that it was taken close to water and not deep into the prairie. Therefore, there was no retreat for the early settlers of Fargo if faced with outside threats. Next, the windows are exposed and remarkably made of stained glass. Not only were the new settlers resilient, but they showed that they had less common resources like stained glass. This picture also indicates that many church builders chose structures with wood frames and concrete footings and were not primitive; they even used mortar and expensive brick. For example, the First Methodist Church (pictured above) located on Broadway represents a religious building with a steeple and the entrance is on the right front side of the exterior. Also, the attention to detail at this time in history shows how fast the growth escalated and progressed. According to the photograph, communication lines are running, thereby demonstrating a significant measure of growth within a relatively short period of time. Knowing that from 1871 to the date of this 1909 picture, the 38 years from rail and working treaties, it is obvious that the progress of making the small prairie tent city to one that now holds such infrastructure such as concrete and brick facades and a diversity of churches is quite a remarkable feat. The city of Fargo by 1909 was full of bustling populations and advanced architecture of brick churches highlighted congregations’ dedication to their individual heritage and the diverse backgrounds in the growing city.